Automotive battery is widely used for starting, lighting and ignition purposes in automobiles. These batteries also provide voltage supply to vehicle accessories such as radio, music players, air conditioners, wipers and charging plugs. Increasing vehicle production coupled with rising adoption of vehicle electrification are anticipated to be the major factors that will create vast opportunities for key players in automobile lead acid battery market. The global automotive battery market is expected to grow at a CAGR of 5.3% over the forecast period i.e. 2017-2024. The automotive battery market is driven by various factors such as increasing number of automobiles on road, rising infrastructure and as well as rising urbanization. Asia-Pacific region is to be trailed by North America and Europe. 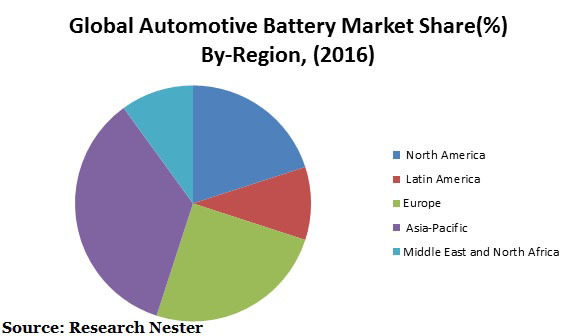 North America holds the second largest share in automotive battery and is likely to exhibit high growth avenues with U.S. automotive battery market. Further, increasing research and development in automotive battery along with government initiatives for electric vehicles in this region are the factors propelling the growth of automotive battery. Europe market for automotive battery is expected to witness a robust growth over the forecast period. Moreover, Germany and U.K are anticipated to capture the largest share in the automotive battery market in this region over the forecast period. Middle East and Africa and Latin America region is also projected to fuel the demand for automotive battery over the forecast period. Riding on the back of growing automotive industry, the automotive battery market is anticipated to show a tremendous growth over the forecast period. Further, rising demand for vehicles such as trucks, cars, two-wheelers and others are envisioned to bolster the growth of global automotive battery market. Moreover, increasing environmental concerns coupled with inadequate oil prices has forced the consumers across the globe to use electric powered vehicles. Governments from various countries are also promoting the adoption of alternative fuel vehicles to reduce the dependence on oil imports; thus, automotive batteries are also widely used in electric powered vehicles. This is believed to foster the growth of automotive batteries over the forecast period. Further, integration of features in automobiles like hands free calling, state of art sensors and car infotainment system have flourished the demand for automotive battery. Moreover, the new fuel saving technologies such as smart hybrid vehicle system (SHVS) are also leading to higher battery usage. These factors are envisioned to bolster the growth of automotive battery market. Likewise, rising personal disposable income of developing economies such as India and China has increased the sales of two wheelers in these highly populated countries owing to high preference of such vehicles as a mode of transportation, which will further boost the growth of automotive battery in these countries. However, automotive battery industries require high energy consumption and are responsible for pollution. Further, government regulations associated with the environmental concerns can restrain the market growth of automotive battery over the forecast period. Zhejiang Narada Power Source Co.